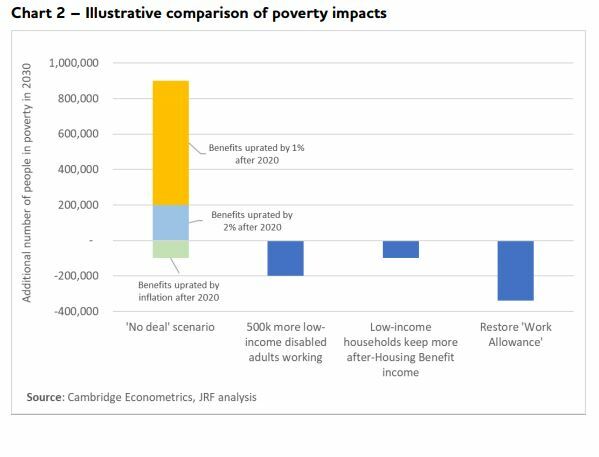 In new analysis published today, JRF warns that poverty and the cost of living are likely to increase and real wages to fall, even if favourable trading arrangements are agreed, as the country leaves the EU. The analysis, drawing on modelling by Cambridge Econometrics, examines various possible post-Brexit trading arrangements. It provides detailed results on the potential impacts on the cost of living, wages and employment looking ahead to 2030. The options range from staying in the single market (a ‘Norway’ scenario) to ‘no deal’, in each case taking into account the difference that the deal makes to tariffs and non-tariff barriers to trade, immigration and investment. In all scenarios, the cost of living is likely to rise and real wages to fall after the UK leaves the EU in the immediate period. 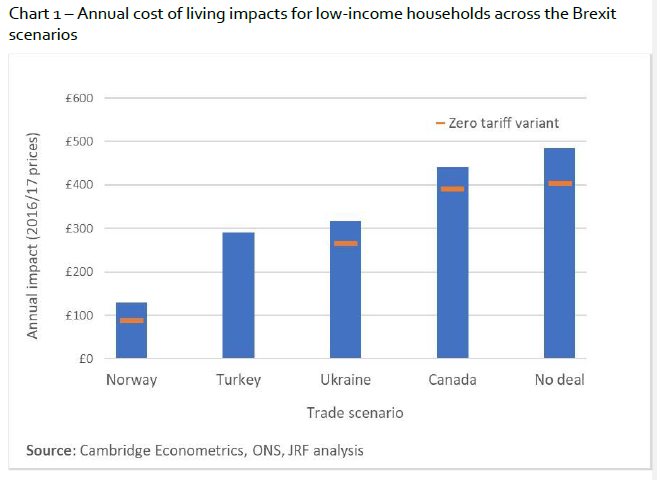 A ‘No Deal’ scenario is likely to have the largest negative effect on costs and wages, even if tariffs are lowered for imports from non-EU countries. This is at a time when we are already seeing the first sustained rises in child and pensioner poverty, and there are more workers living in poverty than ever before. To read the full press release on the JRF website, please click here. For technical information about Cambridge Econometrics’ modelling in this analysis, please contact media@camecon.com. For all others enquiries, please contact the JRF press office.